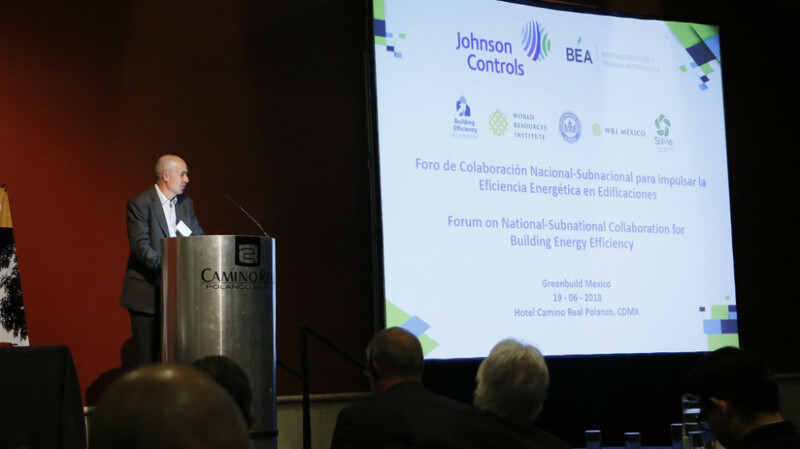 Last month, the US Green Building Council (USGBC), Johnson Controls, and the World Resources Institute (WRI) hosted the “Forum on National-Subnational Collaboration for Building Energy Efficiency,” in Mexico City. The Building Efficiency Accelerator (BEA) event brought together stakeholders from government, industry, development banks, and international cooperation agencies to discuss the role of national and subnational governments in advancing energy efficiency in buildings. Haley Gilbert, energy consultant and former Berkeley Lab researcher from the Building Technology & Urban Systems Division (BTUS), participated on the forum on behalf of MEI and presented aspects of the Mexico Cooling Initiative and other projects related to building energy efficiency, including the buildings' energy efficiency RFP launched by the Energy Sustainability Fund CONACYT-SENER to support joint collaborations between researchers from the University of California system and Mexican institutions in different states. The forum, held as part of the Green Build Mexico 2018 conference, provided the opportunity to examine possible strategies by national governments to enable financial mechanisms and policy pathways for subnational governments to advance building efficiency. The organizers of the event noted the leading role Mexico has played in terms of climate policies and the fact that Mexico City was one of the first cities that committed participation in BEA. Report on the forum by WRI (in Spanish) and a link to the presentations.